Chicago artist Kathleen Judge invited me and other local artists to participate in a show that she is putting together and opens November 7th. Kathleen is one of my favorite poster artists. Most of her designs for her screen printed posters begin as scratch board drawings, a technique that yields excellent texture and line quality. I am particularly excited about the main idea behind this exhibit. Each of the participating artists were asked to design and construct a city block out of cardboard. All of the pieces will then be put together in the 3000 square foot space of Chicago's Viaduct Theatre. I, however, will not be making cardboard buildings. Instead, Judge asked me to submit some of my bird paintings. 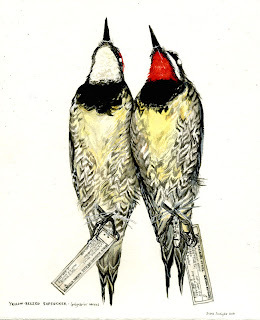 I will have 5 watercolors of birds that, in one way or another, are connected to Chicago's urban environment. I chose species that either nest here, or migrate through, and that most people are probably not aware that they share space with in a big city. I also wanted the species to represent how birds are negatively impacted by cities, and how some have adapted. My first two completed paintings are of specimens from the Field Museum's collections, and were collected downtown ( I think the sapsuckers were collected on Wacker). 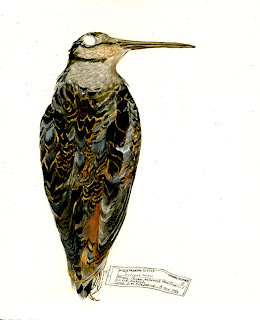 I chose Yellow-bellied sapsuckers and American Woodcocks because we tend to get high numbers of them colliding with buildings during the migration seasons. The other three paintings, which are in progress, will not be of specimens, but of species that have adapted on some level to living in amongst the skyscrapers:Common Nighthawk, Chimney swift, and Peregrine Falcon. So, if you are in Chicago and are looking for something to do next week, come on out! Hope to see you there. Gorgeous work, Diana! John's headed out of town that weekend, but I hope to be at the opening. paint work vs. the death in the subject matter. the ID tags are a nice touch, too. Diana, I just wanted to tell you that I was at Exquisite City last night and loved it. There was a lot to take in, but I especially remembered you and your bird drawings because I have an interest in taxidermy. :-) Congratulations on a fabulous project.